Wishlist Member is one of the oldest WordPress membership plugins around and as such is a stable choice and certainly offers some of the most versatile payment integrations. However, it doesn’t seem to have evolved as quickly as needed in order to keep up with newer plugins like MemberPress and MemberMouse, which offer more advanced features in a sleeker and easier to use package. Wishlist Member is one of the oldest WordPress membership plugins out there, and a such has earned its place as a heavyweight in the membership world. With that said though it is greatly in danger of becoming too outdated, with more and more competition that provides a better feature set and easier use. Whilst it’s still a good plugin and will do the job, it’s definitely not going to be topping the membership charts any time soon without a decent update, which has been long needed. There are however still areas where Wishlist stands out, like with the number of available payment and email integrations. Wishlist Member offers unlimited membership levels and unlimited members and you can create free, trial or paid memberships easily. It also supports ‘Pay Per Post’ style products. 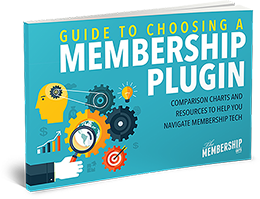 Importantly, members can be part of multiple membership levels at once, something that’s not easily done with a number of other membership plugins. You can also easily select the kinds of content that is protected (including pages, posts and categories) and you can also use partial content protection if only part of a page needs to be hidden. With Wishlist you can create a secure RSS feed too which is great if you want members to be able to access your content via an RSS reader. ‘Sneak peek’ content is another feature than you can enable so any content that appears before the ‘more’ tag on a page/post is available to non-members and they have to sign-up to see the rest of the post. This can be used as a nifty traffic generation tool. One of Wishlist’s main features is their ‘Sequential Upgrade’ system which allows you to automatically move (or add) members to different membership levels after specific amounts of time. This can be great, but it’s also typically used for “drip feeding” content which isn’t ideal (see Ease of Use section below). It does allow you to drip content via either a specific start date or a specific amount of time though. You can choose a different ‘after-login’ page and ‘after-registration’ page for each membership level if you want to, making it ideal for multi-product sites. You can also create custom error pages for different protected pages if needed and you can have different error pages for non-members, wrong membership levels, cancelled members and more. With some payment processors, such as Stripe, you can pro-rate upgrades and choose what happens on cancellation (member immediately loses access or retains access until the end of their billing period). Payment features do vary widely by which payment processor/shopping cart you choose to integrate with. While the ability to generate coupon codes is increasingly becoming a standard part of most membership plugins; Wishlist Member does not offer this facility. One interesting feature is its ‘Email Broadcast’ system which can be used to send members on your site important emails directly, rather than via your email marketing service. This can be useful for important announcements where members may have unsubscribed from your external email list. It’s important to note though that this can’t replace an autoresponder service and you can’t schedule emails to automatically be sent for things like renewal reminders – although you can set one ‘expiring account’ email in the main Wishlist email settings. 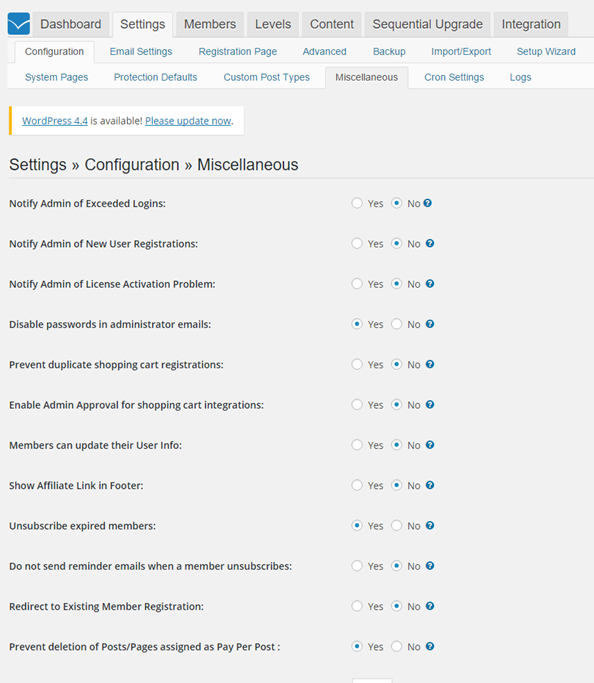 Unlike many membership plugins you can set Wishlist Member up so that members require your manual approval before being given access to the site (useful if offering a free membership) or you can also set things so that members must confirm their email address before their registration is processed. Of course you can still allow completely automatic registration as well though. When you first install Wishlist Member there is a nice set up wizard that helps you get started, allowing you to quickly and easily set up your first membership levels and also allowing you to have Wishlist create certain pages (such as an unauthorised access page) for you so that you then just need to go and add your content. It’s pretty simple and should get you started easily. However, assessing ease of use of Wishlist is actually a little difficult and depends to some extent on the kind of membership you want to create. The Wishlist options themselves are laid out clearly with different tabs for each section, but when you look at the actual number of settings you may want to configure it could easily get overwhelming for the uninitiated. Most settings are self-explanatory though, or come with an explanation, and many require a simple yes/no choice. It’s definitely easier than s2Member, but not as easy as MemberPress. Once you know your way around though it can be set up fairly quickly. 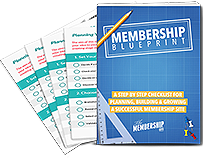 Setting up your basic membership levels is easily done via the ‘Levels’ tab, although there are more advanced options that you can make use of too if you want/need to. For each membership level you can choose different pages to redirect people to after registration and after they log in, which makes life easy if you’re offering multiple products and want a different member dashboard for each. Content protection is also easy with Wishlist Member – you can either use the ‘Content’ tab in the Wishlist settings to set up your protection, or you also have Wishlist protection options on every page, making it easy to protect pages as you create them. You can protect pages, posts, categories, attachments and also set up protected folders and files. There can be issues with protecting certain types of custom post types however, and it doesn’t play nicely with bbPress and BuddyPress. One of my previous bugbears with Wishlist Member was that when integrating with PayPal standard you still had to go into PayPal itself in order to create your payment buttons, following Wishlist’s very particular instructions to add special code to certain areas whilst creating your button. Once done you would then copy and paste the button code back to your site wherever you wanted it to appear. This was the area where I saw most people making mistakes (and it could also be quite time consuming!) and I didn’t really understand why Wishlist still required this considering most membership plugins create payment links for you. Thankfully Wishlist have now updated this, so using PayPal is now much simpler! Now you can set up your initial PayPal integration and then simply create your product buttons/links on the Wishlist ‘Integration’ page – simply choose the membership level and enter your pricing and voila! You have a link you can use or you can use a button shortcode to add the payment to your sales page. Different payment processors and shopping carts require different setups, so ease of use will vary for each, but as a majority of people use PayPal, the fact that this has become much easier is a massive plus point. For many payment processors you still need to go back and forth to set up your payment options, doing some things in the payment processor and some in Wishlist. It’s not really intuitive compared to other membership options. The main area of confusion with Wishlist is drip feeding content. Wishlist Member doesn’t do this the way that most membership plugins do and instead offers something called ‘Sequential Upgrade’. This gives you the ability to add or move a member automatically from membership level to membership level, based either on time since registration or a specific date. Now, this is actually a really handy feature if you wanted to do something like move members to an alumni level after a certain amount of time. However, if you’re drip feeding content this means creating a new membership level for each time you want to drip content. If you were creating a monthly program for a year for example, this would be 12 membership levels needed. If it was a 30 day program it would be 30 – yikes! As you might guess, this can become unwieldy pretty quickly, and it’s easy to make an error when you’re dealing with lots of different membership levels, which is why I don’t recommend Wishlist Member if you want to make heavy use of content dripping on your site. If there is one area where Wishlist Member excels it is it’s integrations. 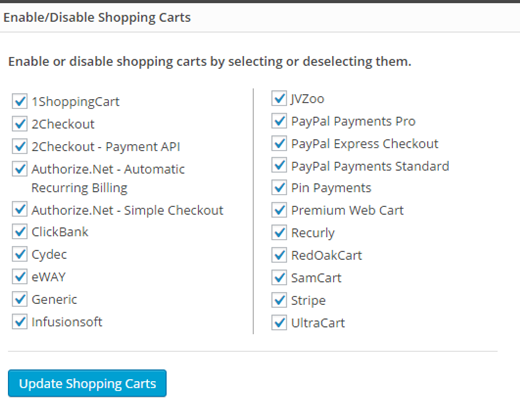 You’d be hard pushed to find a membership plugin that works with more payment processors or shopping carts than Wishlist, including options like SamCart, Infusionsoft and 1Shopping Cart, as well as the standard PayPal and Stripe. It also works with the Zaxaa shopping cart too (which is set up via Zaxaa itself, so this isn’t shown in the list below). 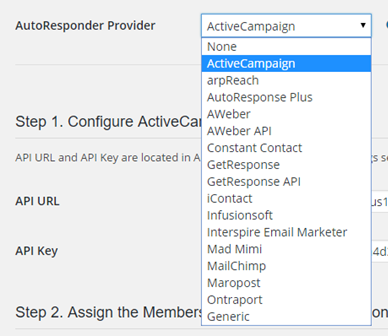 The same goes for email marketing services, with integrations ranging from ActiveCampaign to Ontraport and including several lesser known options. You can also integrate with webinar services such as GoToWebinar and Easy Webinar. It is worth noting that Wishlist doesn’t integrate well with BuddyPress though, so if you’re planning on creating a community with bbPress and BuddyPress it’s not the best option. At $197 for a single site license or $297 for a multi-site license, Wishlist comes in at the more affordable end of the membership plugin spectrum these days. This is a one-time fee but you will then need to pay $47 per year if you wish to continue receiving plugin updates and support (we always recommend you keep up-to-date with updates!). 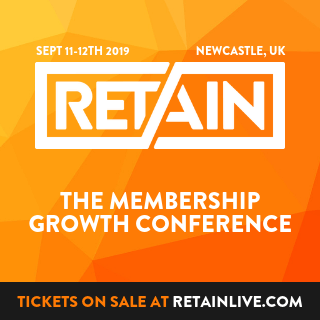 This renewal rate is slightly lower than some other membership plugins, so may offset the initial higher cost in the long run. 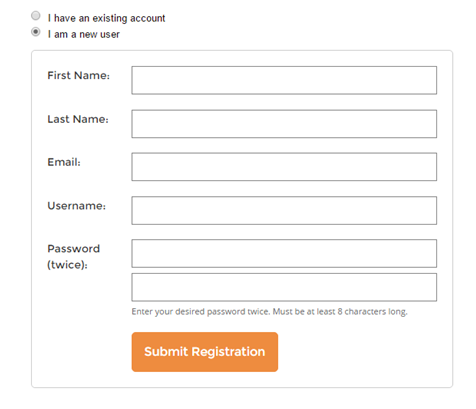 The general registration process in Wishlist is easy enough – a member pays and is then redirected to a registration form to sign up for their on-site account – creating their own username and password in the process. Provided your payment processor is integrated correctly this should all happen quite smoothly for the member and they can then login straight away. You can customize the registration form as needed and the new member will be sent an email via Wishlist with a reminder of their login details. And that’s it really from the users perspective. The membership protection and sequential upgrade should work behind the scenes, so the member won’t really see anything else of Wishlist. The plugin does provide a widget that you can use to display the members details such as name and membership level, but that’s about it. It doesn’t create an account page or any way for a member to manage their own account in order to access things like their billing details or cancel their account. It doesn’t offer a profile for members to complete (or change their password through) either, defaulting instead to the WordPress profile page (which is far from ideal for a variety of reasons). This lack of ‘self service’ for members could become a bit of a customer service bottle neck, especially if you have a lot of members. Wishlist Member doesn’t offer any member reporting or stats, other than a basic list on the dashboard of how many members are enrolled in each membership level. It also doesn’t give any financial information whatsoever so you’ll have to work out your figures manually or through your shopping cart. Similarly you’ll need to work out things like number of new members, cancelled member churn rate and lifetime value manually too. Considering Wishlist has been around so long I’m not sure why no reporting features are available, it definitely makes Wishlist a less attractive choice to me when compared with newer plugins like MemberMouse and MemberPress. In short, if you’re looking for a membership plugin that provides reporting and stats, Wishlist is not for you. What Wishlist does allow you to do with members is easily move them from one membership level to another, either via their sequential upgrade feature or manually. You can also import and export members easily if needed. On the ‘Members’ tab in Wishlist you can add a new member, search existing members and see the membership levels and status attached to any member, including their registration date for each level. You can also approve/un-approve, cancel/un-cancel, turn on/off sequential upgrade and add additional membership levels to members from the ‘Members’ tab. 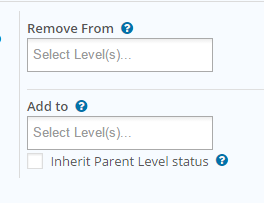 An additional feature is that you could use the membership level settings to add or remove members to additional membership levels automatically when being assigned to a particular level, which can be useful if bundling products. Wishlist Member has a long pedigree with apparently 66,000 users choosing it for their membership, so it’s a stable choice. However, it really is in need of a decent update to bring it in line with more modern plugins before it gets completely left behind. The lack of basic options like an easy way to offer coupons, clunky payment setups, unwieldy content dripping options and complete lack of user manage options and member reporting really leave it lacking. Where Wishlist Member still excels, though, is in the number of third-party integrations possible, so if you’re using a shopping cart rather than simple PayPal or Stripe, or a less common email provider, it’s going to be one of the main options that you want to check out. Overall though, the lack of member reporting features, inability for members to control their own accounts and unintuitive method of content dripping means that it’s a mid-level option in my eyes. Good, but not a star player by any means, especially for the price point.